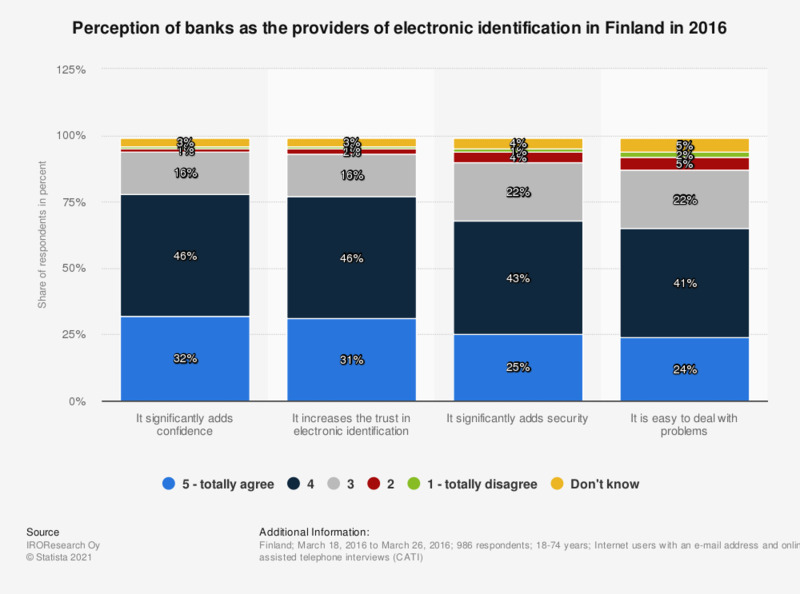 This statistic shows the results of a survey on perceptions of banks as electronic identification providers in Finland in 2016. During the period under survey, more than 75 percent of the respondents perceived banks to significantly add confidence and increase trust in electronic identification. Internet users with an e-mail address and online banking access. The question was phrased by the source as follows: "What does the bank mean to you as the provider of your electronic identification?" In Finland bank customers receive online banking login details and separate codes for logging in to their online bank. These credentials can also be used for identifying oneself in or logging in to other online services. The source does not provide any information regarding missing percentage points to 100 percent or percentage points exceeding 100 percent. Statistics on "Online banking in Italy "
Do you use home banking systems? What are the reasons why you do not use the home banking system? How often do you use online banking with UniCredit Bank? How often do you use online banking with BancoPosta (Poste Italiane)? How often do you use online banking with Intesa Sanpaolo? How often do you use online banking with ING Direct? How often do you use online banking with UBI Banca?